An inspection of 6,031 km out of a total length of 7,517 km of the eastern and western coastal areas of our country in the course of the past 26 years has led to a grim discovery – as much as 33% of the coastal areas have been affected by erosion due to storms, cyclones, sea waves and human constructions. While this erosion has been the maximum in the east coast, it has also come to fore in this study that fresh sand has replaced 29% coastal regions off the 33%. Dr M Rajeevan, secretary in the Indian geological science ministry and Dr M V Ramanamurthy, Director, National Institute of Ocean Technology (NIOT) has prepared a research paper on subjects like sands shifting places, formation of new sand dunes and coastal sea erosion that have taken place during the period of 26 years from 1990 to 2016. Activities like sands shifting from one area to the other and also moving to the opposite side take place due to natural causes, nature’s fury, natural disasters and the impact of coastal waves. This involves soil erosion on one side and sand deposit on the other and should be considered only as a sort of commendable act on the part of nature, opine scholars of oceanography. It has been found in the study undertaken during the last 26 years that 2,156.43 km of the coastal belt has faced sea erosion, while new soil deposits in the surface have taken place spread across 1941.24 km, the report reveals. Even though people are aware of this sea erosion and fresh soil-deposits for a long time, these have to be properly documented along with illustrative maps; and only then, various government departments and agencies will be in a position to undertake suitable corrective measures, feels Rajeevan. 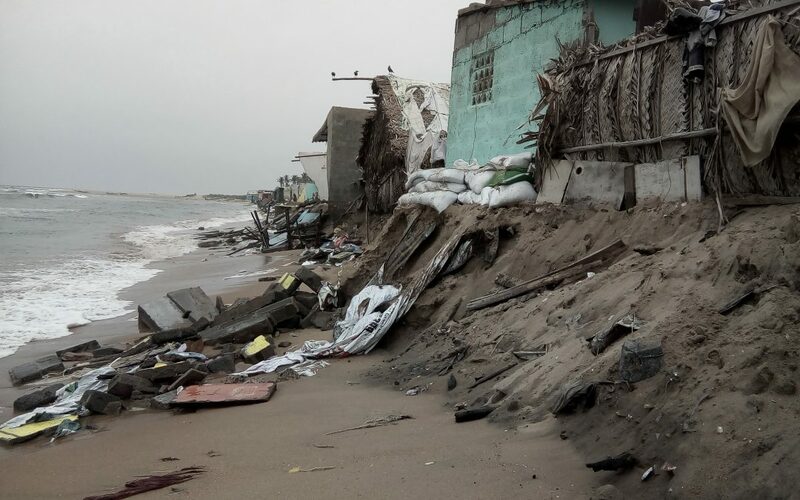 On account of such erosion, sea water enters settlements of fishermen and other people living close to the coast, and the same forces them to lose their residences and places of dwelling. Poor fishermen, who traditionally engage in fishing for their livelihood, used to park their fishing boats and catamarans on the sands close to the sea when they go out for fishing, and can no longer keep their boats there anymore. Agricultural lands lying close to the coast also bear the brunt. It is a fact that the cropping up of new sand surfaces will only be advantageous; but when sand gets deposited in the estuaries of rivers and in the bay-creeks, ecology gets seriously affected. 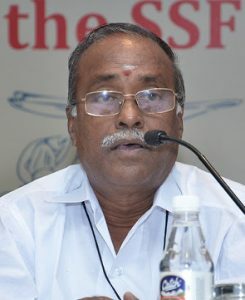 River estuaries, delta regions, bay creeks, backwater reservoirs etc., remain the main areas for sea-life or the sea-living creatures like turtles to breed and hatch eggs, and this atmosphere which supports many forms of lives to thrive, has suffered serious setbacks, says Ramanamurthy, scientist and director of NIOT. Of all the states lying along the east coast bordering the Bay of Bengal, it is West Bengal that has suffered the highest sea erosion. In the last 26 years, 99 square km of the coastal belt, which amounts to 63% of West Bengal state has suffered sea erosion. With 57% erosion in its coast, the union territory of Puducherry comes second. Odisha with 51% and Andhra Pradesh with 42% remain as the states with high sand deposits, as pointed out in the report. It has also been assessed that there have been soil deposits in other coastal states as follows- West Bengal (24%), Gujarat, Diu, Daman (31%), Maharashtra (12%), Goa (20%), Karnataka (30%), Kerala (21%) and Tamil Nadu (23%). Based on the data obtained through NASA space observatory and Indian Space Research Organization (ISRO), information was collected on sea erosion and soil deposit on sea coasts, through the research conducted with the help of 526 maps drawn on 6,031 km coastal area spread across 66 districts drawn from 10 states and union territories. As the reasons for sea erosion differ from state to state, work has now begun on the second stage of the research paper, and this will contain the analysis about the state-wise reasons for sea erosion, says Dr Ramanamurthy. Scientists also say that intensive research will be conducted about the changes that take place in the nature of the waves, their intensity, heavy rains that occur due to storm or depression in the sea, the sea currents associated with the rains, the shifting of soil linked to this, the soil that the rivers bring along to the sea and deposit there, rise in sea level, work on deepening of the ports, the dredging work done at the mouths of the ports, the construction works undertaken in the region, exchanges that take place in the sands accordingly, etc. The Bay of Bengal in the east is always rougher than the Arabian sea of the west, and hence the sea erosion remains much more along the east coast, they added. Commenting about the heavy sea erosion only in the Kerala coast along the west coastal belt, Rajeevan has said that the waves in the southern part of the Arabian sea around the Kerala coast are found to be very strong and extremely aggressive. On account of the rains during the south-west monsoon time of June-September and the north-east monsoon time of October-December, the seas around the east coastal states – Tamil Nadu and Andhra Pradesh – remain rough during most of the year. It is only the east coast that faces bay depressions and cyclonic storms often. It has been assessed that the aggression of the sea is increasing year after year in the east. Dr Ramanamurthy has said that this contributes mainly to the high sea erosion in the eastern coastal regions. However, in many parts of the country, human constructions remain one of the reasons for sea erosion. When dredging activities take place in ports, the soil and other substances removed are mostly dropped in the sea itself. While experts strongly advise that this should be avoided and instead be dropped only in the shores nearby, many do not follow this in practice. In the report of the assessment on environmental impact submitted before granting of permissions to the ports, it is specifically mentioned where and how the dredged soil-material should be disposed of, but none seem to be paying heed to those guidelines. Such sea erosion happens only because permission is granted indiscriminately in many parts of the country to new ports and also for establishing factories harmful to the environment, and these contribute to destruction due to erosion of houses, catamarans, boats and agricultural lands of the residents in thousands of fishing villages, regretted a leader of the fishing community. This is affecting the livelihood of lakhs of traditional fishermen and also their dwelling, making them jobless and homeless, he said. This topic contains 0 replies, has 1 voice, and was last updated by ILANGO M 7 months, 1 week ago.